The book’s chapter arrangement threw me for a loop, with Chapter 1 being Who Needs an Agent, Anyway? Kind of a cart-before-the-horse thing. Most of Part 1, The Business of Romance, is better saved for last. After all, there’s no sense in worrying about agents before the manuscript is written. 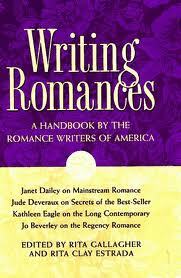 Part 2 focuses on helpful General Information, including what constitutes a romance novel, the role of a romance novel, and writing with passion. But I found Part 3, The Craft, to be the most enlightening, especially for someone (me) who doesn’t have the first idea of how to bring a regency heroine or a medieval maiden to life, or what exactly is the difference between contemporary and mainstream romances. As with any genres, a successful romance avoids the common pitfalls of clichés, stilted dialogue, and unoriginal plotting. Stereotyped characters—the brooding hero, the naïve heroine—are particularly to be avoided. I can imagine that keeping the casting fresh is a huge challenge. God review, Jenny. They may be stereotypes, but I always liked the brooding hero (or the bad boy) back when I read a lot of romances. I've never tried to write one either. It was hard enough just trying to put a little subtle romance into my mysteries. I think the trick with writing a good romance is to have it grounded in reality so your characters are flawed enough to relate to your readers. The second part should be that its just a shade more beautiful than real life. Because lets face it, romance novels are a means of escaping the real world for something just a bit more romantic. I'm certainly no expert, of course, and its been years since I've read a run-of-the-mill romance. Great post, thanks for the review of the book as well.